PC Sync is an older type of flash connection that can be found on most DSLR cameras and there are a few PC Sync units that are worth mentioning which have helped me in days gone by. When I was looking around to design a setup that would let me shoot extreme macro in the field, one of the first considerations was lighting. Having tried a conventional flash bracket with a mounted flash, I found that setup far too big, bulky and unwieldy, so I changed over to a flat horizontal extreme macro setup. But, in order to mount the flash flat, I had to use a Hama tilting connector, and that doesn't carry a proper signal between flash mount and connection (it's just a connector, not a live circuit) so I needed a way to connect camera to flash. The answer was a PC Sync cord. 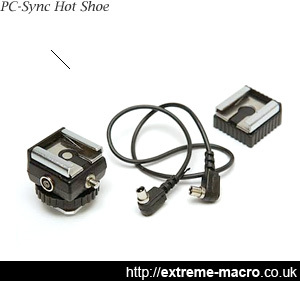 Sonia All purpose hot shoe (3 piece kit), a nice PC Sync hotshoe which does exactly what it's supposed to and doesn't cost the earth. The threaded tightener provides a decent fit and the unit has a couple of PC Sync connection holes and a tester firer. It's a pretty basic unit but never went wrong on me - I used a series of cords and these to control 4 flashes firing together. Costs about £5. I can't really say I've ever had any trouble with PC Sync cords bought from eBay, or that any were superior to any others. They're cheaper than regular camera shop PC cords, and arrive quickly in the post. You can get them in any length to suit you and although they do seem to be expensive for what they are, there isn't a great deal of choice around. PC Sync cords really aren't all that complicated, carrying all of two circuits. If 4 circuit ADSL cords and 8 circuit Cat5 cords can be made for a fraction of the price that these things are made, why PC Sync cord are as still as expensive as they are is slightly beyond me. It's obviously just a gravy train. Keep a pair of pliers handy if you start to find yourself using a lot of PC Sync cords. By tightening the end you can occasionally resurrect what seems to be a broken PC Sync cord. The flashes that I use don't have their own PC Sync port so I had to connect the camera PC Sync out to PC Sync flash shoes with PC Sync ports. The one that I preferred was the "Sonia All purpose hot shoe (3 piece kit)". It's nice because it has a test fire button and 3 PC Sync connections - 2 female and 1 male, with a friction lock mechanism to mount it on a cold shoe mount. It's a pretty basic unit but never went wrong on me - I used a series of cords and these to control 4 flashes firing together. PC Sync is the camera world equivalent of the simplest sort of flash on/off switch, and it's not possible to do PTTL or any advanced modes such as rear curtain sync using PC Sync. PC Sync pops a bulb at the setting on the bulb and that's it. There's no communication back to the camera. No. The "PC" in PC Sync is nothing to do with personal computers. PC here stands for Prontor/Compur, a type of shutter used in older large format cameras. It does not stand for personal computer in this context, and a camera with a PC Sync socket cannot be hooked up to a computer through it.